March 28, 2018 2:45 pm Comments Off on What is the Chemistry That Makes Detergents Work? We all have dirty surfaces that need to be cleaned. We see the soil, reach for the detergent, clean the surface and then move on with whatever we were doing, pretty much taking the whole process for granted. Have you ever stopped to think about what happens when you clean a dirty surface? What kind of chemical reactions take place to remove the soil? 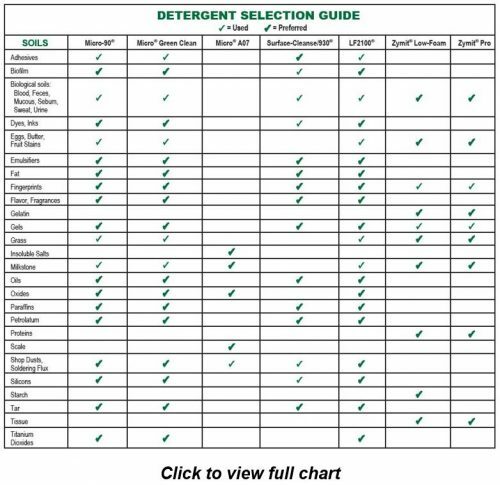 Why some detergents work better than others? 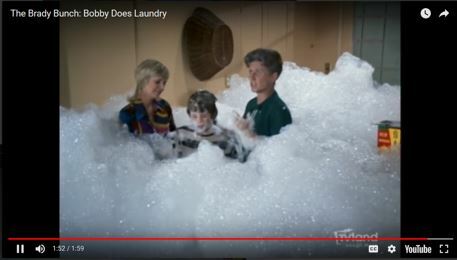 What exactly is the chemistry behind cleaning detergents? Cleaners are made of what? 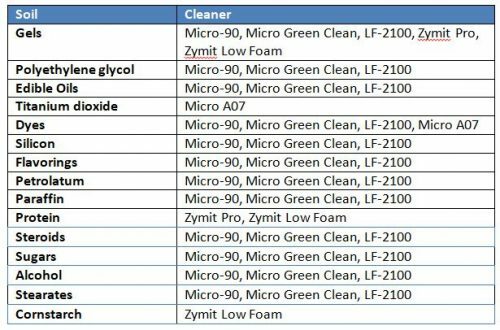 Formulated cleaners are generally composed of four basic elements: surfactants, chelators, builders and carriers. These elements work together to create mechanical actions that remove soils. 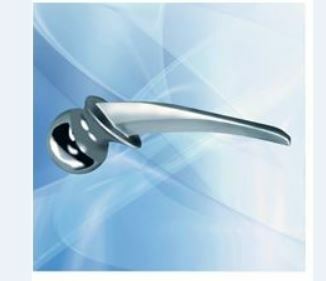 The word surfactant means surface active agent, and, as the name implies, surfactants stir up activity on the surface you are cleaning. 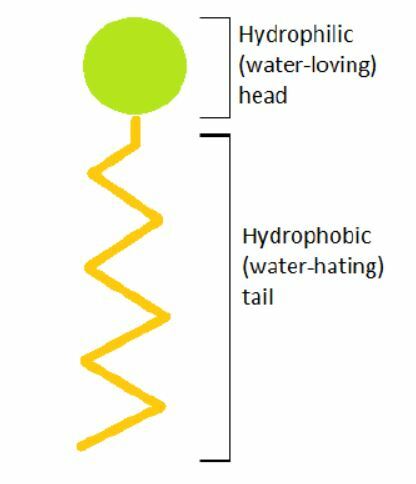 All surfactants have a hydrophobic (water-hating) tail and a hydrophilic (water-loving) head. The hydrophobic tail of each surfactant surrounds soils while the hydrophilic head is surrounded by water. When there are a sufficient amount of surfactant molecules present in a solution, they combine together to form structures called micelles. As the micelle forms, the surfactant heads position themselves so they are exposed to water, while the tails are grouped together in the center of the structure protected from water. 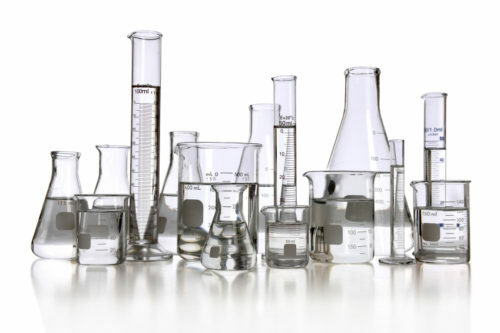 Surfactants are classified as either anionic, nonionic or cationic. Anionic surfactants have a negative charge on their hydrophilic end which helps the surfactant molecules lift and suspend soils in micelles. They tend to create a lot of foam when mixed. Nonionic surfactants are neutral, they do not have any charge on their hydrophilic end, which helps them emulsify oily soils. Cationic surfactants have a positive charge on their hydrophilic ends. The positive charge makes them useful in anti-static products, like fabric softeners. 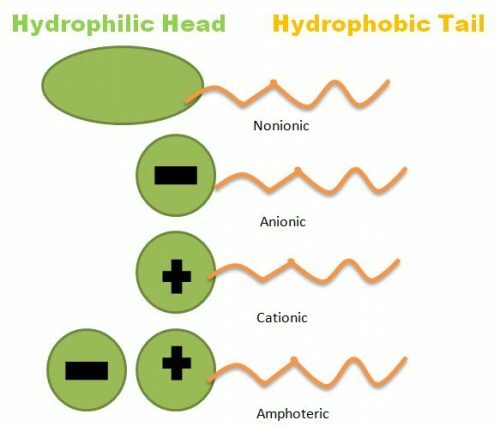 If positively charged cationic surfactants are mixed with negatively charged anionic surfactants, they would fall out of solution and no longer be effective. 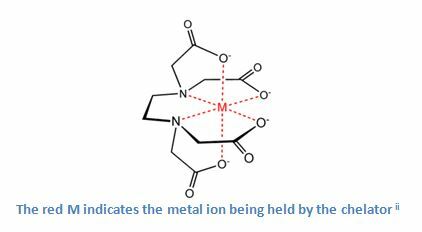 Chelators, substances that bind metal ions together and remove them from a solution, play an important role in the effectiveness of a cleaning detergent. 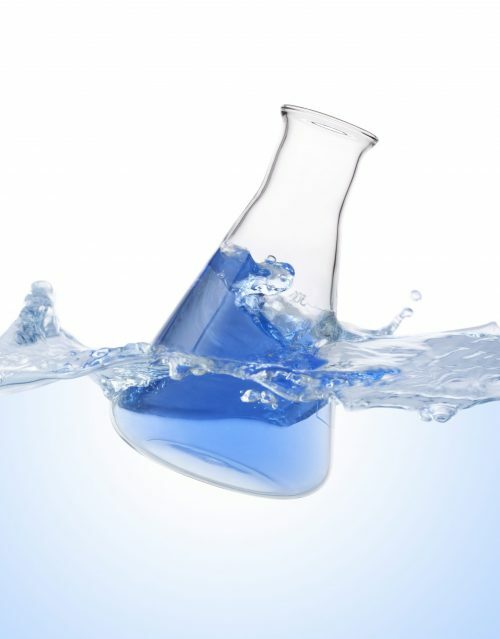 Metal ions such are as calcium, magnesium, iron and manganese are present in water. 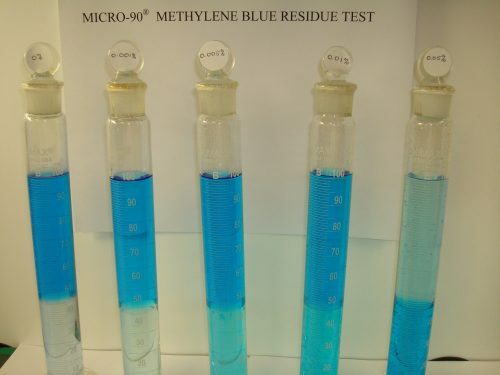 Surfactants are attracted to the metal ions in water, distracting them from acting on the soils we are trying to clean. Chelators attract the metal ions in water and surround them. 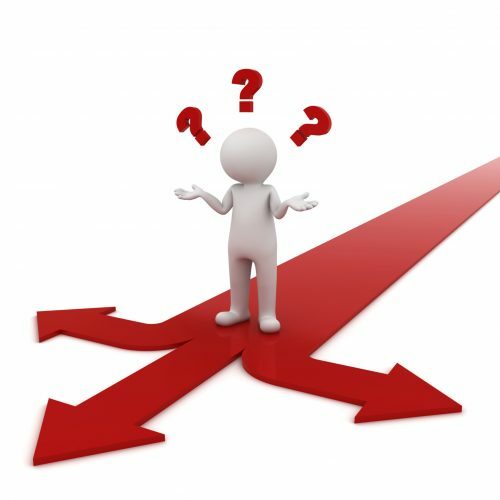 Once the metal ions are trapped by the chelators their electronic charge changes from positive to negative. The surfactants are no longer attracted to the metal ions and are free to focus on the surface soils. 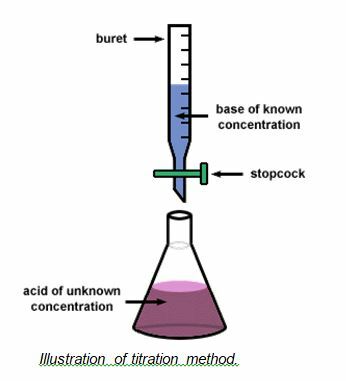 The chelators act as a barrier, cutting off the metal ions from the surfactants, allowing the surfactants to concentrate on fouled surfaces. Builders are added to cleaning products to boost the effectiveness of surfactants. Builders act as buffering, softening and emulsifying agents. Like chelators, builders soften water by neutralizing the effects of any metal ions that are present. 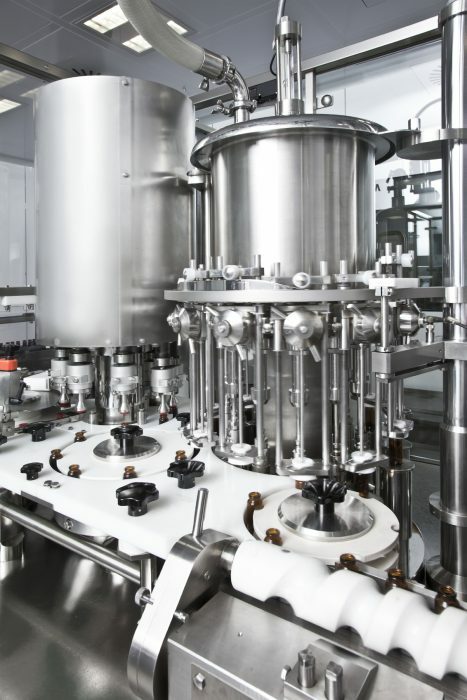 This is done either through sequestration, holding metal ions in solution, or precipitation, causing the metal ions to fall out of the solution as insoluble materials. Builders also serve as buffering agents, helping to maintain the stability of the pH level of the solution. 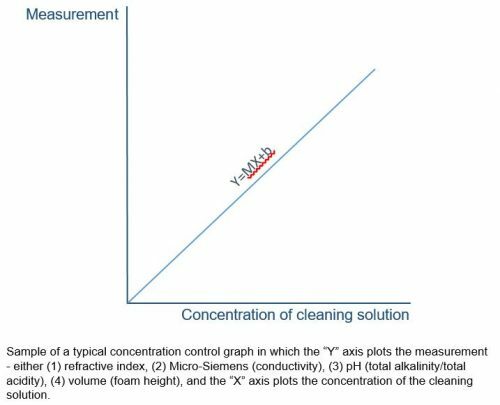 This is important because the level of alkalinity of a solution will affect its cleaning strength. Builders with a higher pH target organic soils, while those with a lower pH work best for cleaning inorganic soils such as metal, oxide and scale. Lastly, builders function as emulsifiers. They loosen dirt on the surface, breaking it down into smaller fragments. The builders then keep the loosened dirt suspended in the solution so it cannot redeposit on the surface. 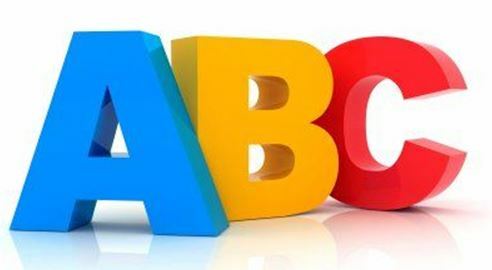 potassium hydroxide, silicates, phosphates, citric acid, nitric acid, lactic acid, glycolic acid, and hydrochloric acid. Carriers are used to help dissolve soils. 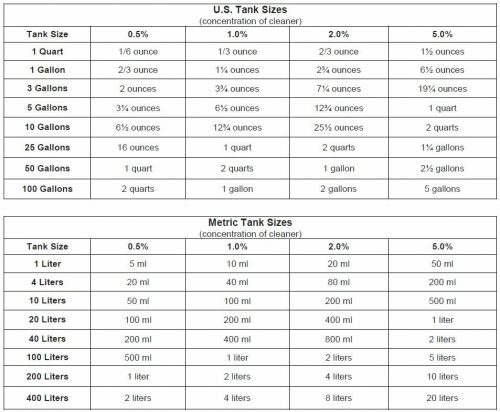 Water is the most common carrier. 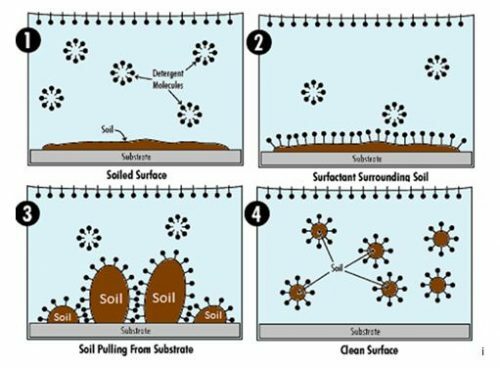 Once surfactants reduce the surface tension, water can penetrate the soils breaking them up into smaller pieces and keeping them suspended in the solution, away from the clean surface. 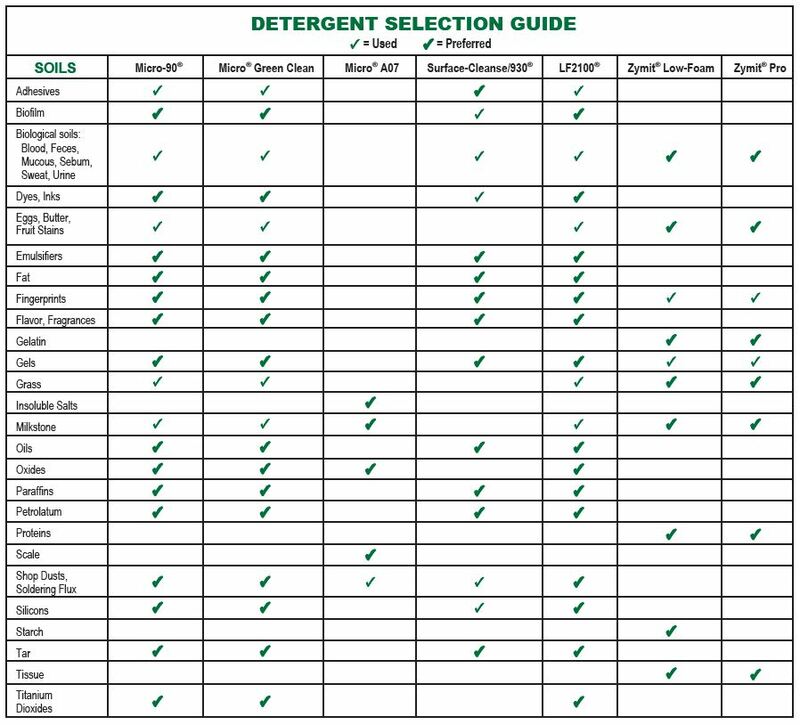 Some cleaning detergents contain chemical solvents. Like water, their function is to break down soils into smaller fragments so the surfactants can do their job. 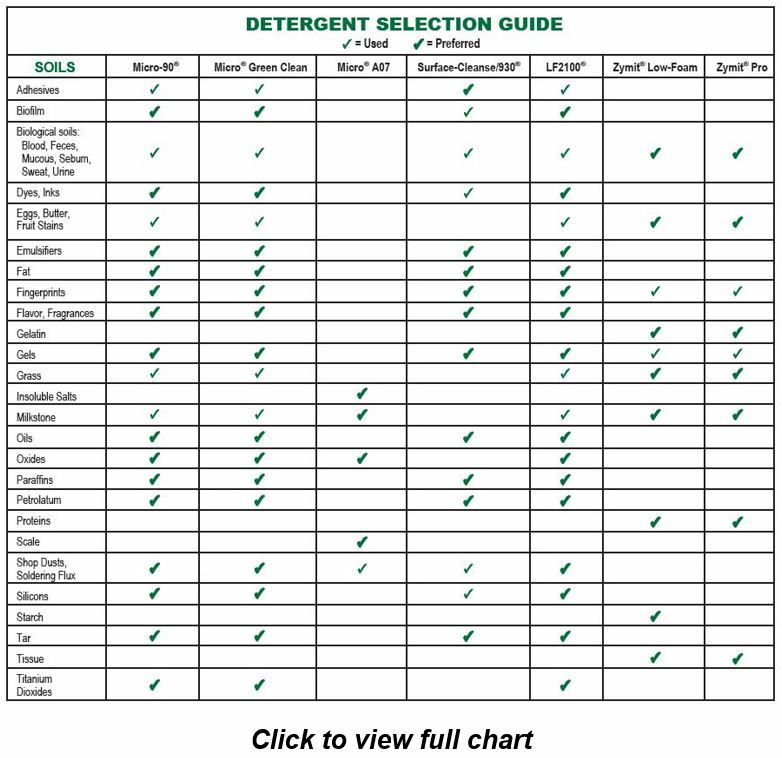 However, many of the chemical solvents that have traditionally been used in detergents can be hazardous. 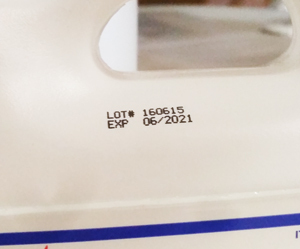 As a result, many people try to avoid products that contain chemical solvents and prefer to use those that rely on water for this important function. 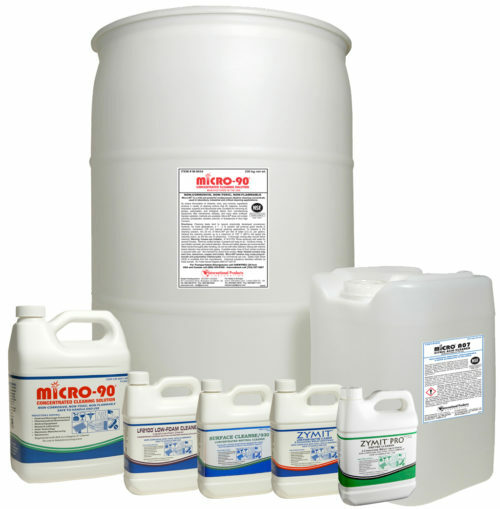 The most effective cleaners have surfactants, chelators, builders and carriers that work together to remove dirt. Look for a formulation that produces a variety of cleaning actions to lift, disperse, emulsify, sequester, suspend and decompose soils. 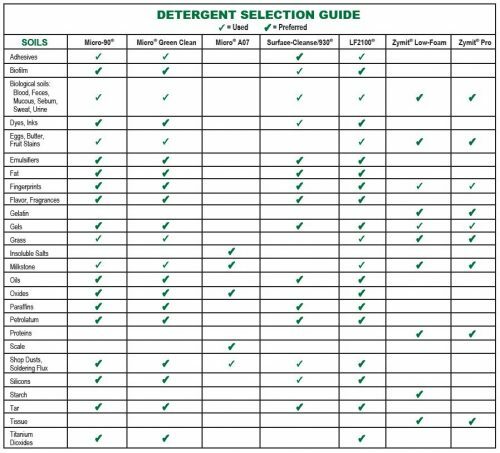 It’s also important to choose safe cleaning detergents that do not contain hazardous chemical solvents. Now that you understand the chemistry of cleaning products, you’ll really appreciate what’s happening the next time you reach for your favorite cleaner and watch the dirt disappear. 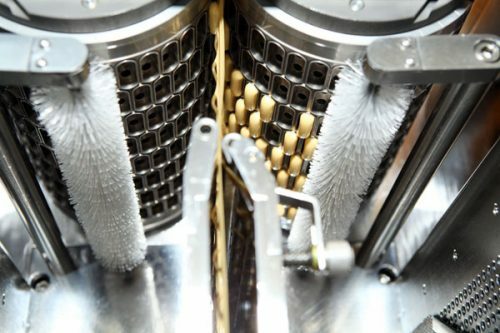 For more information about formulated cleaners visit International Products Corporation’s website or contact one of our technical specialists for assistance.